This was the first time in my life that I produced a drawing that I was proud of. A big thank you to my tutors Richard and Diane - that was the beginning of my creative journey. Finding my own creative path took a while. I formed the Whangarei Inventors club in 2012 as part of my search. I like geometry, sharp defined lines and contrasting colours. As a sheet metal worker pattern development has been one of my stronger attributes. Crop circles, sacred geometry and tribal tattoos are definitive structures that tick my boxes. My sculpture of six vertical seagulls lifted me into a new level of enthusiasm. The work I produce is what pleases my eye, I hope it pleases yours. 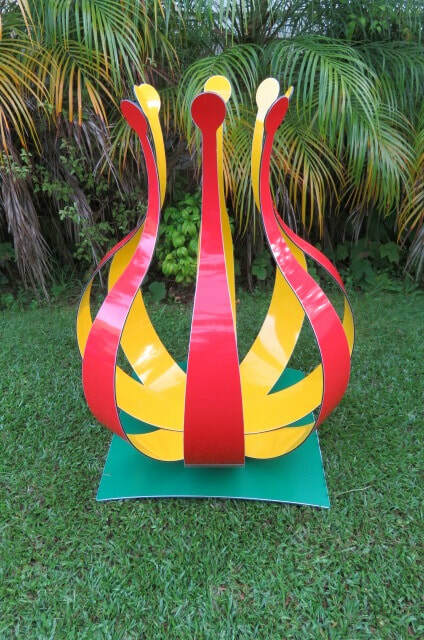 The garden art I create as pictures or sculptures is an extension of me, David Bennett.